These Gold Stocks Doubled in 2016. 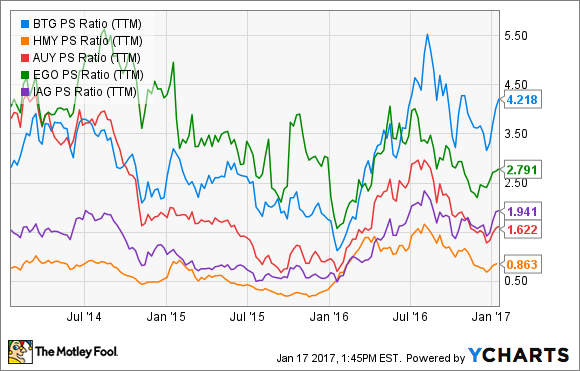 Can They Fly Even Higher in 2017? Plenty of gold stocks beat the S&P 500 last year, but these two crushed it. While the price of gold rose only about 8% in 2016, many investors had good cause for celebration, watching their portfolios gain a little more luster, as gold stocks soared. 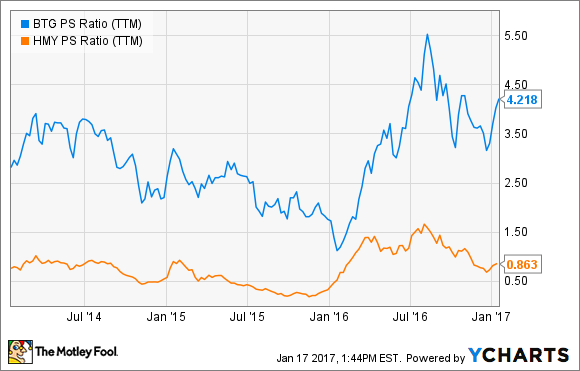 B2Gold (NYSEMKT:BTG) and Harmony Gold Mining Co. (NYSE:HMY), however, crushed it in 2016, climbing 130% and 109%, respectively. Let's dig into the companies' performances in 2016 and see what we can expect in 2017. An intermediate gold producer, B2Gold has four gold-producing mines, three in development, and seven in the exploration phase. Although it hasn't released its fourth-quarter earnings yet, when it does, the company expects to report a record year of gold production -- attributable to strong performance at its Masbate, Otjikoto, and Libertad Mines -- totaling between 535,000 and 575,000 ounces, according to a recent corporate presentation. Should B2Gold report gold production in the middle of this range, it would mean a 13% increase over the 493,000 gold ounces the company produced in 2015. Among other highlights, like reporting positive net income for the first time since fiscal 2012, during fiscal 2016, Harmony achieved one of its primary objectives: strengthening its balance sheet. The company reduced its net debt by a whopping 61%. One feat that both companies achieved in fiscal 2016 was a reduction in all-in sustaining costs (AISC) -- the mining industry's version of operating expenses. Impressive as B2Gold's gold production growth may be, it means little if the company hadn't been able to keep its expenses in check, maximizing the value of the gold it brings to the market. Herein lies one of the company's successes during the year. Whereas it reported AISC of $947 per gold ounce in 2015, the company is estimating AISC to total between $780 and $810 per gold ounce for 2016. And, like B2Gold, Harmony also succeeded in reeling in expenses. In fiscal 2016, Harmony reported AISC of $1,003 per gold ounce -- a 19% reduction from the AISC of $1,231 it reported in fiscal 2015. One expectation that B2Gold has for the new year is that progress will continue to be made on its Fekola mine construction in Mali. Forecasting Fekola to begin gold production in the fourth quarter, management expects the mine's production to total between 15,000 and 25,000 ounces -- about 3.7% of the company's gold production for all of fiscal 2017. Looking one more year into the future, though, illustrates how important the Fekola mine is to B2Gold's long-term success. Construction activities at the Fekola mine site: Image source: B2Gold. Management estimates that in fiscal 2018, Fekola will produce a total of 365,000 to 375,000 gold ounces, accounting for approximately 40% of the company's total gold production for that year -- a range of 900,000 to 950,000 ounces. Though still early in the development phase, the Kiaka project -- which management claims in one of the largest undeveloped gold resources in West Africa -- is also worth paying attention to. Management expects a feasibility study to be completed of Kiaka, located in Burkina Faso, in mid-2017. Although there aren't any particular growth catalysts -- like the Fekola project coming online -- Harmony has set some aggressive goals for the new year. Building on its recent success in fiscal 2016, Harmony is looking to strengthen its balance sheet even further in the coming year. In its integrated 2016 annual report, management identified a target of zero net debt by the end of fiscal 2017 -- not something you find very often among mining companies. Focused on South Africa, where it has 10 gold-producing mines, Harmony Gold further expanded its operations outside Africa this year by executing its growth strategy and acquiring Newcrest Mining's 50% interest in the Hidden Valley mine in Papua New Guinea. Hidden Valley mine: Image source: Harmony Gold. Having announced the transaction during the first quarter of fiscal year 2017 (which ended on Sept. 30, 2016), Harmony now retains 100% ownership of the mine. According to management, the mine has the potential to contribute approximately 180,000 gold ounces per year at an AISC of less than $950 per gold ounce within the next three years. To put that in context, management's guidance for fiscal 2017 is total gold production of 1.05 million ounces of gold at an AISC of $1,100 per gold ounce. Investors shouldn't be surprised if the mine doesn't achieve those figures this year. Management estimates that the mine will produce only 47,500 gold ounces at an AISC of $1,420 per gold ounce. Since the companies have inconsistently reported positive net income and free cash flow over the past three years, the price-to-earnings ratio and price-to-free cash flow ratios won't provide much insight. Instead, let's consider the stocks in terms of their price-to-sales ratio on a trailing-12-month basis. Over the past three years, B2Gold's stock has traded as low as 1.1 times sales and as high as 5.5, and Harmony's stock has traded as low as 0.18 and as high as 1.63. Currently, B2Gold's shares are trading at about 4.1 times sales; Harmony's shares are trading at about 0.86. Both companies, by this metric seem reasonably priced. Arguably, B2Gold trades at such a premium to Harmony because its ability to reign in spending so rapidly, resulting in a much more efficient operation. The company is forecasting AISC in fiscal 2016 to hover around $800 per gold ounce while Harmony reported AISC above $1,000 per gold ounce for the year. But to provide more even greater context for the stocks' valuations, let's consider them alongside their peers: IAMGOLD, Eldorado Gold, and Yamana Gold. Although B2Gold seems to trade at a premium to its peers, it is still within it's average three-year range, so this, in and of itself, should certainly not scare away investors. Likewise, Harmony seems to trade at a steep discount to its peers, but it's within its range for the past three years, so this should not indicate that the stock is a screaming buy. Both B2Gold and Harmony saw their stock's rise impressively in 2016, but to expect the same sort of growth in 2017 seems unrealistic. This isn't to say that shares don't have room to run in the new year -- just that expectations should be tempered. Apparently, Wall Street has treated both stocks fairly, and investors compelled by either company's plans for the future -- after digging deeper -- should regard their valuations as reasonable.